In Chapter 6 (correlation and covariance) I consider how to construct a confidence interval (CI) for the difference between two independent correlations. The standard approach uses the Fisher z transformation to deal with boundary effects (the squashing of the distribution and increasing asymmetry as r approaches -1 or 1). As zr is approximately normally distributed (which r is decidedly not) you can create a standard error for the difference by summing the sampling variances according to the variance sum law (see chapter 3). This works well for the CI around a single correlation (assuming the main assumptions – bivariate normality and homogeneity of variance – broadly hold) or for differences between means, but can perform badly when looking at the difference between two correlations. Zou (2007) proposed modification to the standard approach that uses the upper and lower bounds of the CIs for individual correlations to calculate a CI for their difference. He considered three cases: independent correlations and two types of dependent correlations (overlapping and non-overlapping). He also considered differences in R2 (not relevant here). The call the function use the two correlation coefficients an sample as input (the default is to assume equal n and a 95% CI). As I point out in chapter 6, just because you can compare two correlation coefficients doesn’t mean it is a good idea. Correlations are standardized simple linear regression coefficients and even if the two regression coefficients measure the same effect, it doesn’t follow that their standardized counterparts do. This is not merely the problem that it may be meaningless to compare, say, a correlation between height and weight with a correlation between anxiety and neuroticism. Two correlations between the same variables in different samples might not be meaningfully comparable (e.g., because of differences in reliability, range restriction and so forth). In many cases the correlations you want to compare aren’t independent. One reason for this is that the correlations share a common variable. For example if you correlate X with Y and X with Z you might be interested in whether the correlation rXY is larger than rXZ. As X is common to both variables the correlations are not independent. Zou (2007) describes how to adjust the interval to account for this correlation. In essence the sampling variances of the correlations are tweaked using a version of the variance sum law (again see chapter 3). The following functions (not in the book) compute the correlation between the correlations and use it to adjust the CI for the difference in correlations to account for overlap (a shared predictor). Note that both functions and rz.ci() must be loaded into R. Also included is a calls to the main function that reproduces the output from example 2 of Zou (2007). The r.dol.ci() function takes three correlations as input – the correlations of interest (e.g., rXY and rXZ) and the correlation between the non-overlapping variables (e.g., rYZ). Also required is the sample size (often identical for both correlations). Overlapping correlations are not the only cause of dependency between correlations. The samples themselves could be correlated. Zou (2007) gives the example of a correlation between two variables for a sample of mothers. The same correlation could be computed for their children. As the children and mothers have correlated scores on each variable, the correlation between the same two variables will be correlated (but not overlapping in the sense used earlier). The following functions compute the CI for the difference in correlations between dependent non-overlapping correlations. Also included is a call to the main function that reproduces Zou (2007) example 3. Although this call reproduces the final output for example 3 it produces slightly different intermediate results (0.0891 vs. 0.0917) for the correlation between correlations. Zou (personal communication) confirms that this is either a typo or rounding error (e.g., arising from hand calculation) in example 3 and that the function here produces accurate output. The input here requires the correlations from every possible correlation between the four variables being compared (and the relevant sample size for the correlations being compared). The easiest way to get the correlations is from a correlation matrix of the four variables. Wilcox (2009) describes a robust alternative to these methods for independent correlations and modifications to Zou’s method that make the dependent correlation methods robust to violations of bivariate normality and (in particular) homogeneity of variance assumptions. Wilcox provides R functions for these approaches on his web pages. His functions take raw data as input and are computationally intensive. For instance the dependent correlation methods use Zou’s approach but take boostrap CIs for the individual correlations as input (rather than the simpler Fisher z transformed versions). The relevant functions are twopcor() for the independent case, TWOpov() for the dependent overlapping case and TWOpNOV() for the non-overlapping case. Zou’s modified asymptotic method is easy enough that you can run it in Excel. I’ve added an Excel spreadsheet to the blog resources that should implement the methods (and matches the output to R fairly closely). As it uses Excel it may not cope gracefully with some calculations (e.g., with extremely small or large values or r or other extreme cases) – and I have more confidence in the R code. Baguley, T. (2012, in press). 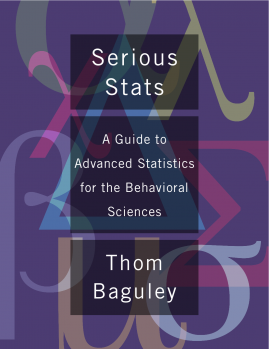 Serious stats: A guide to advanced statistics for the behavioral sciences. Basingstoke: Palgrave. Zou, G. Y. (2007). Toward using confidence intervals to compare correlations. Psychological Methods, 12, 399-413. Wilcox, R. R. (2009). Comparing Pearson correlations: Dealing with heteroscedascity and non-normality. Communications in Statistics – Simulation & Computation, 38, 2220-2234. Thank you for this excellent explanation! It really made everything clear to me. Just a couple of points. I have a question concerning the representation of the results. How would you report the confidence interval of the difference? And second, how to consider multiple comparisons? In my case, I compare three overlapping correlations. The CI of the first one is slightly overlapping with the second, and the second and third are almost the same. So in principle I am just interested if the first one is higher than the other two. If I perform CI of the difference as described here, I get small bust significant differences (CI ~0.02 -0.09). To report this result I would just write: There was a significant difference between the correlation of XY and XZ (CI: 0.02-0.09). ?